As many as 80 gravestones at a Jewish cemetery in France were discovered vandalized on Tuesday morning, adding to the latest wave of anti-Semitic attacks in the country. As many as 80 gravestones were vandalized at a French Jewish cemetery in the village of Quatzenheim, discovered on Feb. 19, 2019. Credit: Screenshot. The cemetery, located in the village of Quatzenheim, near the border with Germany, was desecrated with swastikas painted on gravestones—one of which consisted of the words “Elsassisches Schwarzen Wolfe,” or “Black Alsacian Wolves,” a group that associated with neo-Nazis in the 1970s. French President Emmanuel Macron will visit the damage at the cemetery on Tuesday prior to visiting the Paris Holocaust memorial, French Interior Minister Christophe Castaner told RTL radio. This development occurred hours ahead of marches nationwide against the latest anti-Semitic trend in France. Former French presidents Franςois Hollande and Nicolas Sarkozy, who is Jewish, joined in solidarity. On Saturday, protesters from the “yellow-vests” movement who have been demonstrating over recent months against Macron’s government, yelled anti-Semitic profanities at philosopher Alain Finkielkraut, who was targeted with labels such as “dirty Zionist s***,” “Dirty Jew,” in addition to being told, “You’re a hater, you’re going to die, you’re going to hell.” Finkielkraut was guarded by police. The previous day, two teenagers were apprehended after allegedly firing shots with an air rifle towards a Paris synagogue, injuring one Jewish gentleman. The motive was anti-Semitism, according to prosecutors. Also part of the latest anti-Semitic wave includes a tree commemorating a young French Jewish man who was tortured to death in 2006 being cut off, the word “Juden” (German for “Jew”) scribbled on the window of a Paris bagel bakery, and swastikas drawn on Paris mailboxes decorated with a picture of former government minister and Holocaust survivor Simone Veil, who died in 2017. French Interior Minister Christophe Castaner said last week that the number of recorded anti-Semitic acts soared by 74 % in 2018. Israel’s Prime Minister Benjamin Netanyahu commented: “Today something shocking happened in France. 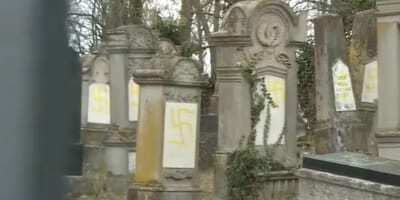 Eighty Jewish graves were desecrated with Nazi symbols by wild anti-Semites.